Those who support DepEd's K to 12, like Aquino, seem too quick to claim quality, but their claims are not really supported by evidence. 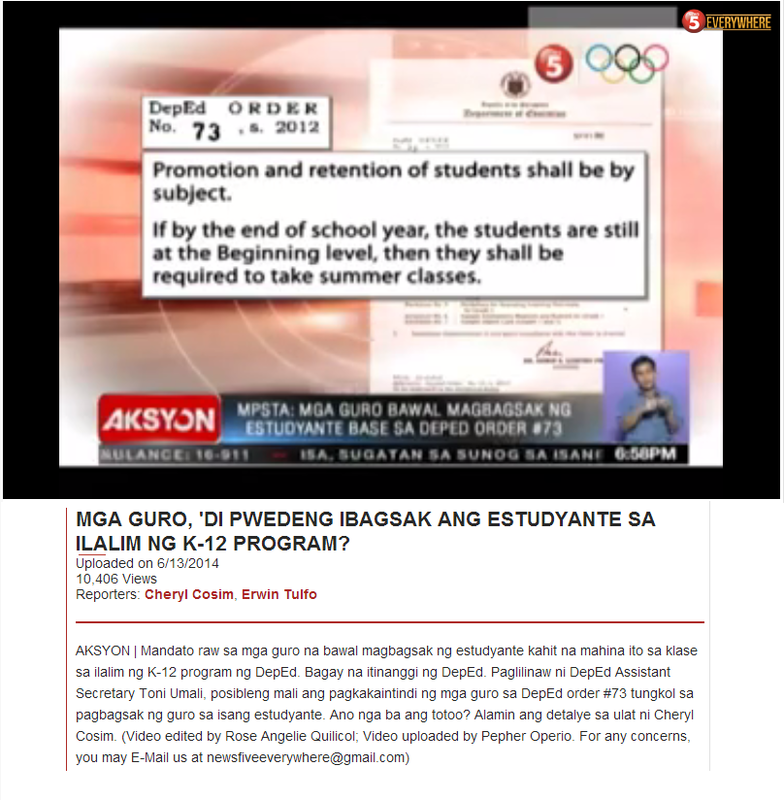 While this blog demonstrates clearly what is wrong with DepEd's K to 12, some defend the new curriculum with a clear ignorance of what the new curriculum really is. Take, for instance, the issue of reading. The outgoing president of the Philippines, Aquino, once said, "At the core of our children’s non-learning problems is the inability to read properly. By the end of the next administration (SY 2015-16), every child passing pre-school must be a reader by Grade 1. Essential to this, we must build a library infrastructure in our schools, procure reading books (from our Philippine publishing industry to support local authors and publishers) and train our elementary teachers on how to teach reading. By the end of the next administration, every child must be a reader by Grade 1." There is actually nothing in DepEd's K to 12 that will help make this happen. This is simply a blatant lie. One can compare the above with class schedules that are meant to make every child a reader by Grade 3 (Notice that this is a much less loftier goal than Aquino's). 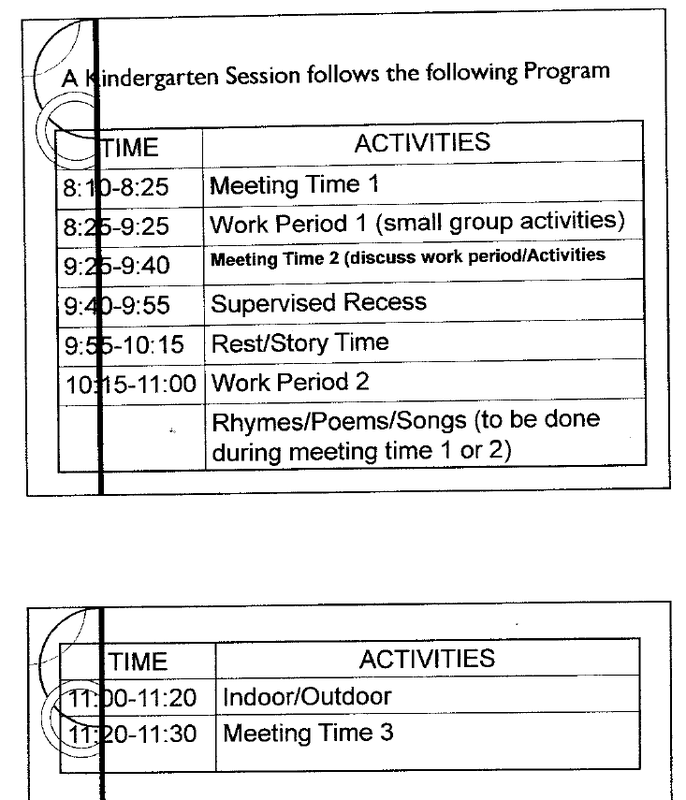 Below are sample schedules of classes in public schools in Georgia that are implementing the "Reading First" program. The blocks of time dedicated to language arts are in bold. This kindergarten teacher has the support of a paraprofessional for small-group time. Notice that differentiated instruction occurs during workshop time. Also notice that there are three read-alouds each day. This first-grade teacher works alone. Notice the number of read-alouds and the plan for diversification by genre; also notice the use of center activities to facilitate flexible groups for differentiated instruction. 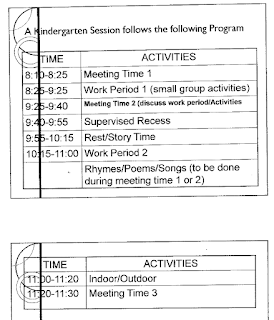 Dictation and spelling – word building, etc. 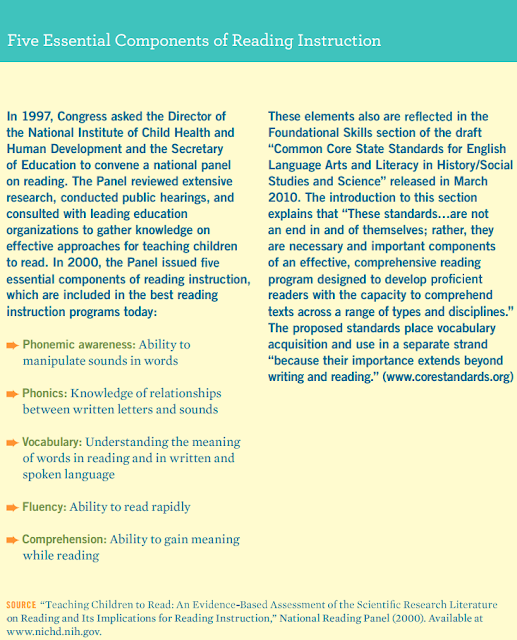 Comprehension – oral comprehension, etc. Notice the use of literacy work stations so that children can practice and reinforce their literacy skills while the teacher works with small groups. That structure allows her to provide differentiated instruction, with more work with phonics and decodable books for those students who need it, and more work with grade-level materials for those who do not need additional phonics. This third-grade teacher begins the day with comprehension strategy instruction and makes time for needs-based work by using both cooperative and independent activities. Notice that there are two blocks for science and social studies. 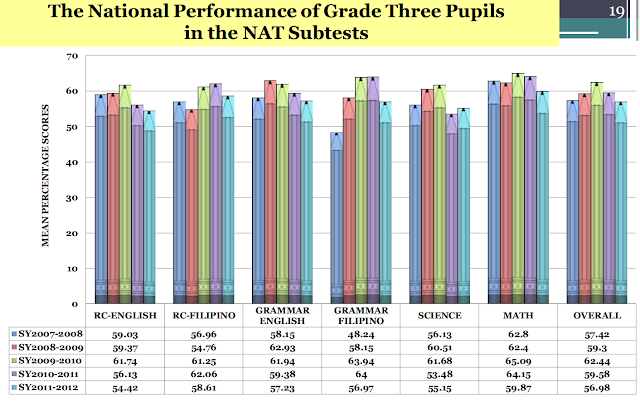 Unlike the class schedules of schools in Georgia, it is not easy to calculate how much time DepEd's K to 12 really devotes to reading since much of its first grade is oral and three languages are simultaneously being taught. In the above, the time for DepEd's K to 12 is simply the total time given to English. Being able to read at third grade is very important. Here is a repost of an article on this blog. Pruning is a key process that shapes the brains of young children. Synaptic overproduction causes synapses to develop extremely rapidly. The pruning process refines these connections based on experience. Connections used regularly become stronger and more complex. Connections not used are considered non-essential, and the brain eventually prunes them away to increase efficiency. As an example, an infant's brain has connections that allow her to hear sounds from all languages in the world. During the early years, the brain strengthens connections for sounds in the languages she hears regularly. Over time, the brain eliminates the connections for other sounds. This is why most adults have trouble distinguishing sounds that are not in our language. The time periods for brain development are not set in stone. The stages are likewise not abrupt. Thus, goals, such as "Every child a reader by grade 3", are best estimates, or in this particular case, a good limit. After Grade 3, students are now expected to read to learn. Children who cannot read at this point likewise suffers in science and math since textbooks and other printed learning materials on these subjects are incomprehensible. Reading proficiently at this grade level is strongly correlated with high school graduation rates, as well as earning potential, global competitiveness, and general productivity. This gap widens during the toddler years, again correlating with early health problems as well as lack of exposure to to early interactions that foster linguistic development. Poor development in social and emotional skills contributes to this gap. The gap widens during formal schooling since oftentimes students who need the most are given the least resources. Chronic absences from school exacerbate this gap. Children who are exposed to problems outside school interfere with these crucial years of learning. 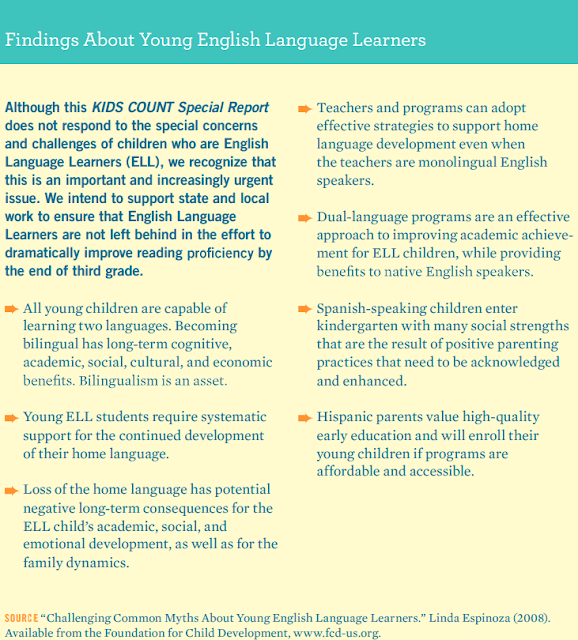 The report from the Casey Foundation likewise adds a section on English-language learners. For this, it borrows from a study by Linda Espinoza, "Challenging Common Myths About Young English Language Learners". 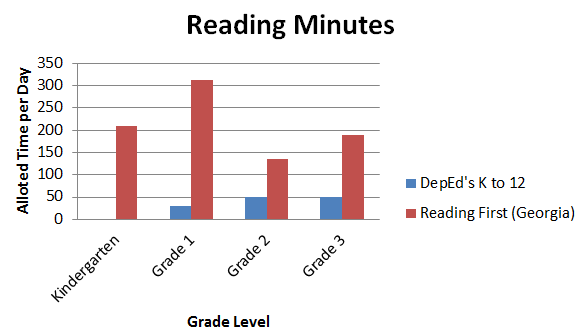 Reading by Grade 3 involves not just learning a specific language. It involves cognitive development that goes beyond recognizing or comprehending a given language. Reading is different from oral language. Mother tongue based instruction must likewise assist a child in developing cognitive skills that are necessary for learning in the following years. The ability to manipulate sounds in words, knowledge of relationships between written letters and sounds, understanding the meaning of words, ability to read rapidly, and the ability to gain meaning while reading, all of these equally apply to any language used in instruction. Choosing the mother tongue as medium of instruction indeed makes the school closer to home, but without the proper reading instruction, mother tongue based instruction likewise would fail. "There's more to reading than meets the eye." "Students Need to Attend School Daily to Succeed"